AFTER SEVERAL HUNDRED flights with my DJI Phantom 3 Pro, I've started getting electromagnetic interference during the pre-flight phase. I know the interference is probably coming from the fan and diesel particle filtration system on our recently-purchased Skoda Yeti. We hear the Yeti's fan running for up to 15 minutes after the engine is shut down whenever we drive the car leisurely around town. The rotation of the fan motor seems to generate electronic interference with the DJI Phantom 3 drone. 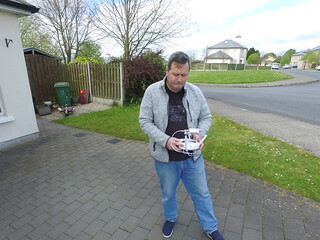 I get no interference when setting up and flying the drone from our housing estate but I'm nowhere near the car before turning on the DJI Phantom 3 Pro's avionics. I can duplicate the electromagnetic error if I power up the drone next to the Skoda Yeti when its engine fan is running after a run around the local area. I have stopped calibrating the compass before every flight because doing that seems to inject more problems with the waypoints I program for the drone to fly in Litchi. And when I do my compass calibrations, I am more than ten 10 meters from any vehicles, preferably in a dirt field. I also refer to the sensor section of the DJI Go app settings and view the compass data. I compare the numbers to the compass reading I have on my Samsung Galaxy Note 9. During part of 2017, the sensor data compass numbers were zero, indicating I had damaged the landing gear and its fine wires when my drone hit a tree at 20 mph.